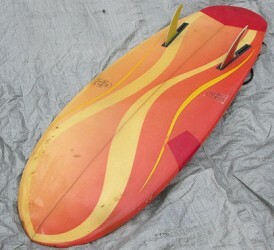 Foam blank with 1/4" redwood stringer, multi-sprayed, two 10" fin-boxes, R/hand plug. Post-production professional repairs in red resin on the tail and right-hand rail. Bottom: flat, with vee through the tail. Inside flat, foiled on the rail side. Three way laminate- yellow, white, orange. The screw tongues are located at the rear. 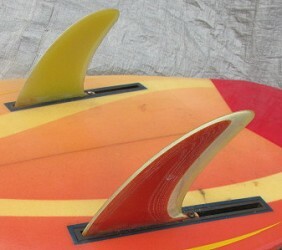 Two 10" fin-boxes, toed-in @ 13''- black. Deck: FT graphic- yellow,red and black and Friar Tuck Surf Design, 236 Harbord Road, Brookvale, (02) 938-3270 at sweet-spot- black text. 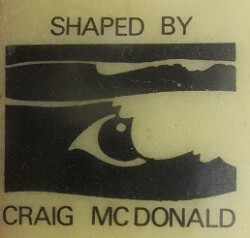 Shaped by Craig McDonald, graphic and text- black at pod. 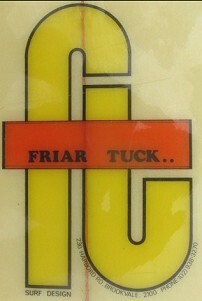 Bottom: FT graphic and Friar Tuck Surf Designs, 236 Harbord Road, Brookvale, (02) 938-3270 offset on each rail, small- black text. Deck: 2119 - pencil on stringer at the tail. Deck: Clear, before repairs in red resin. Bottom: Red spray with clear hour-glass panels, yellow resin curves. 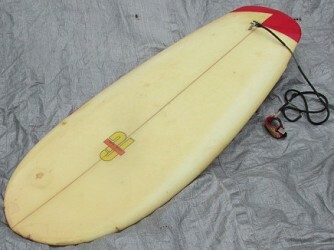 Bought second-hand as a back-up board from Barry Taylor Surfboards, South Nowra, circa 1977-78. Generously donated by Alan Jones, Shoalhaven Heads, in 2014. 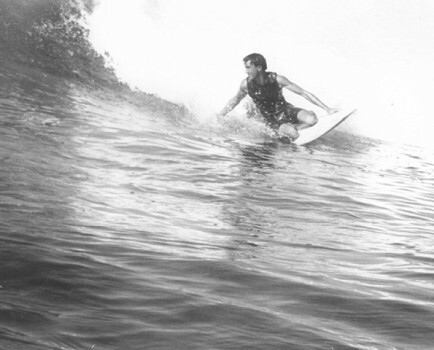 Left: Alan Jones, Little Avalon, circa 1968. 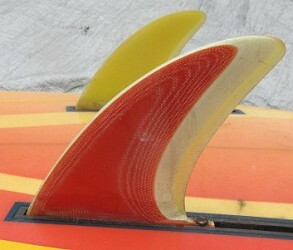 The twin fin-boxes are in the established tradition of kneeboard fin variation and experimentation. McGinness : How to Ride a Surfboard Chapter 6. McGinness : Surfing Fundamentals Chapter 6. 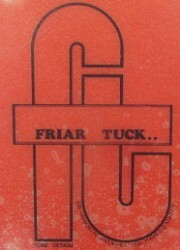 Geoff Cater (2015) : #262 Friar Tuck Twin-fin Slab, 5ft 6'', 1978.